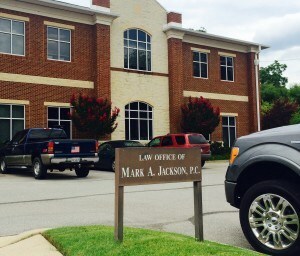 Based in Huntsville, Mark A. Jackson, P.C. 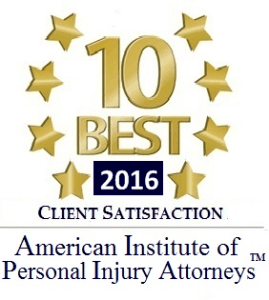 represents accident victims throughout Alabama in personal injury and wrongful death claims arising out of motor vehicle collisions, 18-wheeler crashes, drunk driving accidents, workplace and construction accidents, nursing home abuse, defective products, cell phone/texting accidents, fall related injuries and dog attacks. Our firm also has extensive experience helping clients recover compensation after an accident caused by an uninsured or underinsured driver. 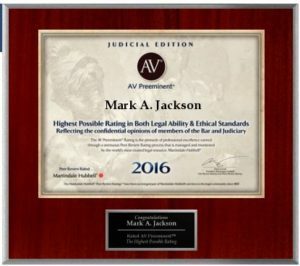 For over 25 years, attorney Mark A. Jackson has devoted his legal practice to helping injured victims and their families receive fair and proper compensation for their losses. Today, he has handled more than 1,000 cases, both through settlement and jury trial. His determination to help his clients recover to the full extent possible under the law has resulted in many verdicts and settlements exceeding $1 million. As a life-long resident of Huntsville/Madison County, Mr. Jackson’s goal is to yield many years of satisfied clients by continuing to build on his solid reputation in the local community. Mark’s personal injury and wrongful death cases are referred to him by fellow lawyers, past clients, and community leaders. If a case needs to be tried to a jury in order for an injury victim to receive fair compensation then that is what Mark does. Before hiring a lawyer you should ask him or her “when was the last time you personally tried a jury trial?” Flashy TV and billboard advertisers will not want to answer that question. 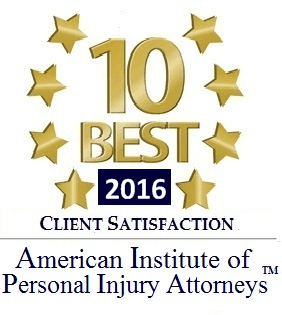 Make sure you are hiring an experienced personal injury courtroom litigator. In 2016, Mark was awarded the highest possible rating by both his peers and the judiciary! 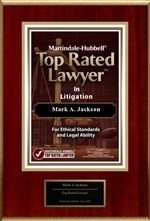 In 2017 and 2018, he again received the highest possible rating in both legal ability and ethical standards. 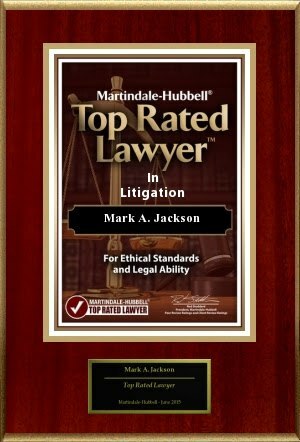 Mark was recognized in 2015 by Martindale-Hubbell peer review ratings as a “Top Rated Lawyer in Litigation”. 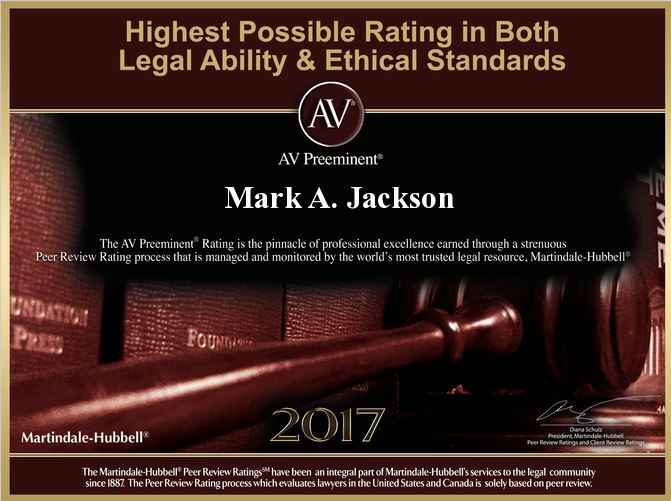 The AV Preeminent Rating, is the pinnacle of professional excellence earned through a strenuous Peer Review Rating process that is managed and monitored by the world’s most trusted legal resource, Martindale Hubbell. Putting our clients’ needs first is our mission. This firm does not charge an hourly rate for services. Rather, we work on a contingency fee basis, meaning that you do not pay attorney’s fees until you recover compensation. 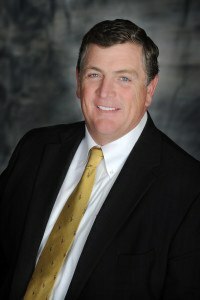 If you or a loved one has been harmed in an accident, call Mark A. Jackson, P.C. at (256)533-5306 for a free consultation. We have a Spanish interpreter on staff, and also conduct home and hospital visits.